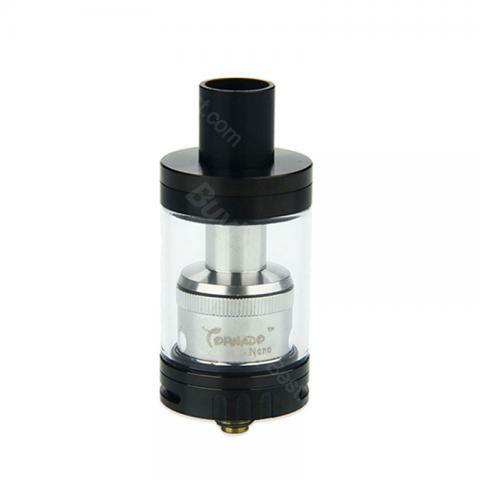 IJOY Tornado Nano is a innovative tank which comes with build-in chip coils and a 18.6mm two post RTA build deck. Together with photochromic glass, you will have a fun vaping with it. Black and ss colors. IJOY Tornado Nano features the innovative build-in chip coil, which is mainly used for electrical conductivity and heat dissipation, make Tornado Nano a real chip inside tank. It also comes with 18.6 mm Two Post RTA coil, features screwing the screws from the top, allowing for easy mounting of dual coil builds. Combining a color change glass, users can get more fun on the IJOY Tornado Nano. When exposed to sunlight, or vaping for a while, the glass becomes translucent. All coatings are glass exterior, completely safe and harmless. Prim the coil for 1 minutes and start vaping. • You can buy Chip coil separately. • It can compatible with IJOY Tornado Nano Frosted Glass Tube. My first experience with ijoy tanks because I don't like the look of the other ones. A well made tank. The first time I built it, it leaked on me. Luckily I chose to build it with 3.5mm diameter coils because if not, I don't think it would've wicked right if I just jammed cotton into the wells to stop the leaking. I also pulled the cotton down and placed it nicely so they are visible from the juice holes. You could probably fit 4mm diameter coils since the deck is huge. I like the different placement of the screws on the deck. It makes it slightly easier to build. Flavour is on par with all my other well performing tanks. And it's 24mm so it looks good on a lot of the newer style mechs. There are so many great tanks out right now, get this if you like the look of it.